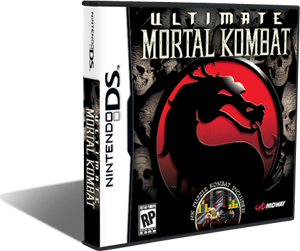 Ultimate Mortal Kombat is currently the one and only Mortal Kombat game on Nintendo DS. 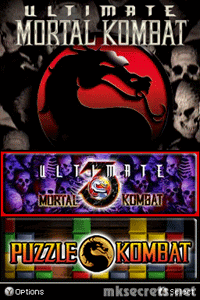 It contains a nearly perfect port of Ultimate Mortal Kombat 3 with included Wi-Fi play and also the mini-game Puzzle Kombat from Mortal Kombat: Deception. Ultimate Mortal Kombat was released on November 12th. and is rated M for Mature. 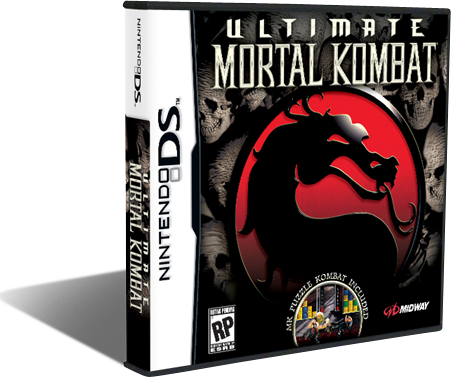 Despite the quality of the Ultimate Mortal Kombat 3 port for Nintendo DS there are still lots of differences worth mentioning. First it's the speed. The game is almost 20% faster than the Arcade version. This has negative effect on most characters because of the nearly perfect timing their juggles require. Since the screen is stretched, the graphics look uglier compared to those of the original Arcade version. One of the most broken things in this port are the Run Jabs which are the main VS tactic in the game. The corner pushback properties are different for them. Here they allow you to infinitely low punch someone until they die, in case they don't block. They will be kept in the backwards hit animation. Some collision boxes are different too, for example sometimes Nightwolf's axe will miss after combos when normally it would hit. Wi-Fi play works pretty well most of the time. The main letdown here is that there are certain levels that cause lag in the gameplay. The lag is associated with background animations consuming to much processing time on the DS. 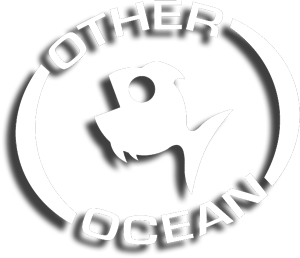 Limiting any kind of special effects, like blood, will help in a lot better multiplayer experience. The bottom screen has slower refresh rate and is mainly meant to be used for its touch-capabilities. 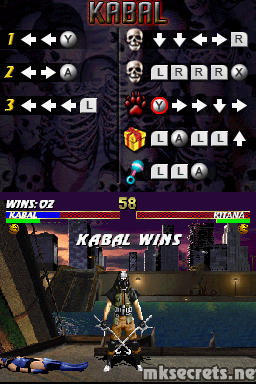 In Ultimate Mortal Kombat 3 it is allowed to configure the role of the screens which I see as a good thing. Screens also, from arenas to menus are loaded quickly before they are displayed instead of a quick change. The hiddens stay unlocked after unlocked for the first time and there is extended time for selecting characters at the Select Your Fighter screen. 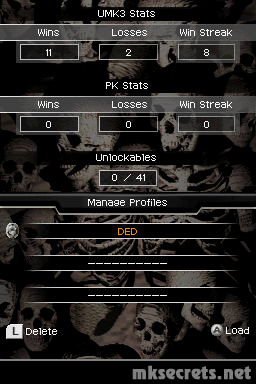 The audio of the game arcade perfect, Shao Kahn now talks, encourage, just like in the arcade version. 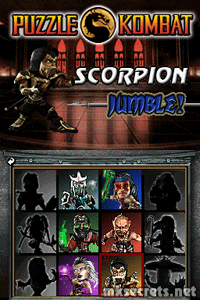 Part of this title is also Puzzle Kombat, which was originally developed as a mini-game for Mortal Kombat Deception.  This game is also playable over the Nintendo Wi-Fi Connection service, just like the original version can be played Online. 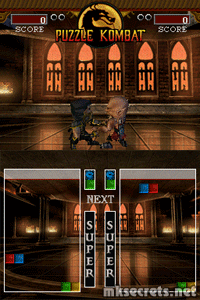 Each character can pull out a different special move by filling up a meter. These moves include the ability to jumble up your opponent's pit, to remove blocks from your own, and so on. 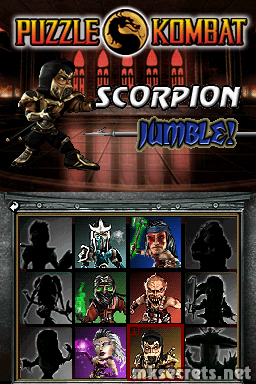 The music of Puzzle Kombat is great and sets just the right mood for the game, delivering all sounds from the Mortal Kombat: Deception version. Thanks to the second screen you can see the combination for your moves at any time during combat. Another great feature in the game is the ability to play a demo version of the game over Wi-Fi if the other person does not have Ultimate Mortal Kombat. In this case you can only play with the ninja characters. Of course somethings are removed like Attract Mode from the arcade version and 2on2 Player and 8 Player Tournament are replaced by Local Wireless and Nintendo Wi-Fi Connection respectively. 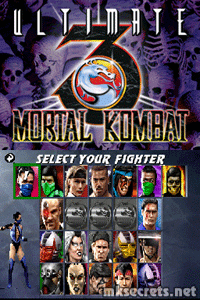 Something interesting is that in early trailers, Midway showed us footage from the Genesis and the Snes versions of the game (remember something similar happened with Mortal Kombat 3 in MAT2 trailers), which confused the fans alot, but in the later ones they started to use original footage. Both games were converted over to the Nintendo DS by Other Ocean Interactive, the same team that worked on the Xbox Live Arcade version of Ultimate Mortal Kombat 3. All I can say is that they did a great job, given the power of the DS.